You may own a high-rise building having multiple commercial establishments and offices. You may also be worried about its maintenance, particularly keeping its exteriors and windows dust-free and clean. You need professionals and sophisticated equipment to carry-out the maintenance activities. With more skyscrapers dotting the skylines of major cities around the world, high-rise building maintenance has become a highly specialized profession. As technology outclassed the conventional window cleaning methods in high-rise buildings, the risk factors too has gone done considerably making the profession highly safe and rewarding. 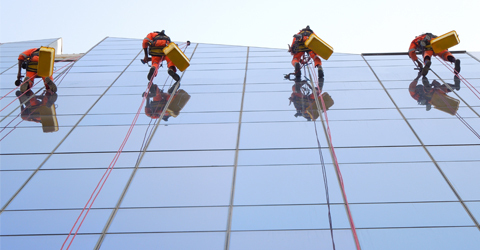 To meet the huge demand for qualified and experienced high-rise window cleaning professionals, Green Smart Technical has been offering window cleaning and other building maintenance services in high-rise buildings in and around UAE region using the most advanced, time-tested, safe and reliable ‘rope access’ window cleaning technology. Clients engage Green Smart Technical for their buildings for its efficient and safe handling of works, service quality which is sustainable and professional approach to complete the project within the agreed time frame and budget. Window cleaning in high-rise buildings and towers using rope access technology require efficient team of professionals who have experience in handling wide range of maintenance and cleaning works at extreme peaks. Green Smart Technical has well qualified and experienced engineers and professionals who can handle any kind of maintenance work at dangerous peaks efficiently using rope access method and standard cleaning agents which are environmentally safe. Quality of works makes Green Smart Technical stand apart from others in the similar domain. Along with offering high-quality services for window cleaning and other high-rise building repair works, the materials and equipment used are of high quality which meets all international standards of environmental and personal safety. The professionals and technicians are trained to deliver high-quality, smooth and sustainable services within specific time and budget. Professionalism plays a major role in customer satisfaction and GST knows it well. Workers who are deputed to carryout window maintenance works using rope access method are trained to exhibit highest degree of professionalism at clients’ places. Since the team is well groomed, it guarantees flawless completion works with the full satisfaction of customers. Along with quality and professional approach, customers get their works done efficiently at a very nominal price. Working at the peaks of residential and official towers requires high-quality life-support system. Rope access technology by their side, workers can render their quality service at any difficult and dangerous peak without worrying much about their safety. GST uses secure and widely followed rope access technology to send their men to dangerous and in-accessible peaks to perform maintenance works such as window cleaning and other repair works safely and efficiently.